As a graduation present, your client purchases her son a home. Although the plan was for the son to live there alone, the client and her son take title as joint tenants. Years later, your client remarries and asks you to convey her interest in the house to her new husband’s children on her death. What do you do? Whatever instrument you choose, be sure to sever the joint tenancy! A key feature of joint tenancies is that each joint tenant has a right of survivorship. CC §683(a). Consequently, when a joint tenant dies, his or her interest passes by law to the surviving tenant. As a result, the interest doesn’t pass to the decedent’s chosen beneficiaries and isn’t subject to administration of the decedent’s estate. See Grothe v Cortlandt Corp. (1992) 11 CA4th 1313, 1317. In particular, a will or revocable transfer on death deed will be ineffective in conveying a joint tenancy interest absent severance. Although there are some questions as to the effect on a joint tenancy interest transferred into a trust, the best practice is to first sever the joint tenancy before executing a deed transferring the interest into the trust. Declaring the severance in writing. Note, however, that the severance isn’t effective until the written instrument is recorded in the county where the property is located, sometime before the death of the severing tenant. The instrument can only be recorded after the severing tenant’s death, up to seven days, when the instrument was executed no more than three days before the severing tenant’s death. CC §683.2(c). For in-depth coverage of the intersection of real property ownership and estate planning, including thorough discussions of tax implications, check out CEB’s brand new title Real Property Ownership and Taxation. 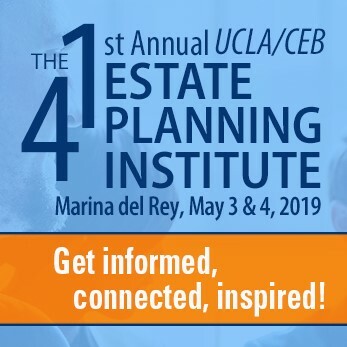 For a holistic overview of the estate planning process, including economic and noneconomic considerations, turn to CEB’s California Estate Planning. Why not deed the property from A&B as joint tenants to A&B as tenants in common? Thank you for your comment, Richard! As you mentioned, co-tenants can always agree to convert a joint tenancy into a tenancy in common. To unilaterally sever a joint tenancy, however, the severing tenant should execute one of the listed instruments and record the document in the appropriate county. Absent an agreement, “deeding the property from A&B as joint tenants to A&B as tenants in common” may qualify as a “written instrument that evidences the intent to sever the joint tenancy” (see CC §683.2(a)(2)), but as a precaution, it’d be prudent to include specific language stating that intent.